Prison gerrymandering undermines the constitutional principle of "one person, one vote." The Supreme Court requires electoral districts to be based on equal population in order to give each resident the same access to government. But a longstanding flaw in the Census counts incarcerated people as residents of the prison location, even though they can't vote and aren't a part of the surrounding community. When legislators use unadjusted census data to draw district lines, people who live close to the prison get more of a say in government than everybody else. The state legislature and some municipalities have previously used Census Bureau counts that tabulated incarcerated people as residents of the prison location, inflating the local population counts used for legislative districts. Padding legislative districts with prison populations artificially enhances the weight of a vote cast in those districts at the expense of all districts that do not contain a prison. The issue is further complicated in by the Massachusetts constitution, which requires the state to use the census as a basis for determining state legislative districts. The legislature passed a joint resolution "Urging the Census Bureau to Provide Redistricting Data that Counts Prisoners in a Manner Consistent with the Principles of 'One Person, One Vote,'". The resolution was sponsored by Senators Sonia Chang-Diaz and Linda Dorcena Forry. The resolution calls on the Census Bureau to change the way the Bureau tabulates prison populations. By tabulating incarcerated people at their residential addresses, as called for in the resolution, the Bureau would create a national and permanent solution to prison gerrymandering. And although a restrictive state constitutional clause in Massachusetts made it difficult for the legislature to change the way incarcerated people were counted for the 2012 redistricting cycle (as Maryland and New York have), the Massachusetts legislature took an important step toward ending prison gerrymandering when they tackled the issue in the redistricting committee's final report. Senate Chair Stanley Rosenberg and House Chair Michael J. Moran devote about a quarter of their report to reviewing the vote dilution caused by the Census Bureau's decision to tabulate incarcerated people as residents of the prison location instead of at their legal home addresses. 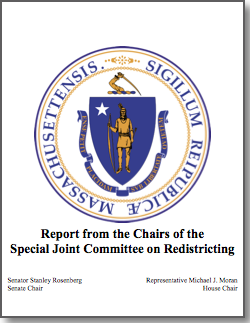 Massachusetts can also consider revising the state constitution to allow the legislature to adjust Census data for redistricting purposes in the future, ensuring that prison populations do not add additional unwarranted political clout to the districts that contain them. Tabulating incarcerated populations as if they resided where the correctional facility is located also causes other problems for towns in Massachusetts, which have achieved individual legislative solutions. The towns of Harvard, Lancaster, Middletown, and Shirley have asked the Governor to introduce special legislation (H03439, H03440, H03468, and 2001 Mass. Acts ch. 133, respectively) so that they would do not need to draw additional precincts for the non-voting prison population. On March 27, 2013, more than 20 Massachusetts-based organizations submitted a joint letter urging the Massachusetts Legislature's Joint Committee on Election Law to pass S 309/H 3185, a resolution calling on the Census Bureau to count incarcerated people at their home addresses. Would your organization like to be added to this list of supporters? Let us know!